To Lay to Rest Our Ghosts is, as acclaimed author Steve Yarbrough writes, “nothing short of magnificent.” These ten exquisite short stories are ones you’ll find yourself reading again and again as you savor each phrase and rejoice in the power of story. I began reading the collection in May and allowed myself only one story a week as I didn’t ever want them to end. I soon found myself rereading the stories and bending my rule to read just one more. More than two months later, I’m still returning to consider the characters I’ve come to know and the insights they’ve imparted as Hamilton Summie’s astute observations continue to penetrate my heart. The sense of place evoked by these stories forces the reader to stop to examine the landscape as in the description of an area where “A row of young elm trees runs behind the fence in a neat and even line, save one, which leans into its neighbor as if it’s relieved to share the burden of once having stood upright.” That line has altered my rural driving pattern from one of simply scanning the shoulder for deer to adding a search for leaning trees while pondering whether I myself am standing upright or need to share my own burdens. There is so much to recommend in these narratives, yet the greatest gift they offer is showing how real people deal with loss as in this sentence reflecting the book's title when a grandfather speaks about his son’s death: “. . . finding Edward’s name carved into the far left panel of the Vietnam War Memorial, one name among many, the only one I loved; and weeping, with my head to the cool, inanimate marble, weeping beside other men and women and in front of children, who watched as we laid to rest our ghosts, strangers all, yet connected.” Hamilton Summie takes characters that are strangers to us and connects us to them in a way that leaves us profoundly affected and grateful to have spent time inside her word pictures. One of my favorite authors is the late Kent Haruf, a master of spare, eloquent prose and a writer who used geography and place with precision. 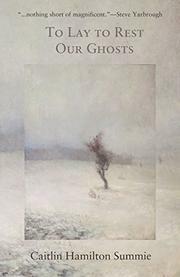 To Lay to Rest Our Ghosts reminds me of Haruf’s novels in its homage to ordinary people, in its quiet, composed manner of writing about loss and grieving, in its evocation of landscape as character, and in the way it leaves me wanting more. Three stories in the collection, “Patchwork,” “Geographies of the Heart” and “Taking Root” feature characters from the same family. After rereading those stories, I cared so much about Al and Sarah and their family that I ached to find out what made them “alive, like electricity. . .” just as these stories are. When Sarah looks at her grandmother and recalls, “You do not abandon family," Grandma had often said during my growing up years, "no matter what,” I felt it an omen and was glad to learn in this interview with Hamilton Summie that she’s at work on a novel about Al and Sarah. Read this collection of beautifully wrought stories to fall in love with a variety of characters and settings while gaining insight into your own relationships and losses. I predict that you’ll reread and cherish this book. Summing it Up: To Lay to Rest Our Ghosts is a collection of eloquent, grace-filled stories that offers readers a mirror into their own souls. If you enjoy the spare, affecting writing of Kent Haruf, read this. Buy two copies – one for yourself and one to give someone you love. Note: Caitlin Hamilton Summie is my friend. We’ve never met in person, yet her astute insight has steered me to many exceptional books she’s shepherded. Her kind and caring manner toward her associates is echoed in her attention to the characters in this collection.